6 "WAKE UP DEMOCRATS! Take Back the Country"
Hilda Solis is the pro - socialist U.S. Secretary of Labor. Before this she served in the United States House of Representatives from 2001 to 2009 for California. She is married to Sam Sayyad who is a small business owner. Hilda Solis was born on October 20, 1957 in Los Angeles, California. She is the daughter of Mexican and Nicaraguan immigrants, Raul Solis and Juana Barela-Solis. Her father, Raul, is a Mexican union shop steward and her mother, Juana, is a Nicaraguan assembly line worker. Solis has stated that her parents and six siblings continue to be a great source of inspiration to her. In 1979, Solis earned a Bachelor Degree from California State Polytechnic University, Pomona . In 1981, Hilda Solis earned a Master of Public Administration from the University of Southern California . During the President Jimmy Carter Administration, Solis worked in the White House Office of Hispanic Affairs as an intern. Solis was later appointed as a Management Analyst with the Office of Management and Budget in the Civil Rights Division. Solis served in the California State Assembly from 1992 to 1994 and made history by becoming the first Hispanic woman elected to the California State Senate (1994-2000). 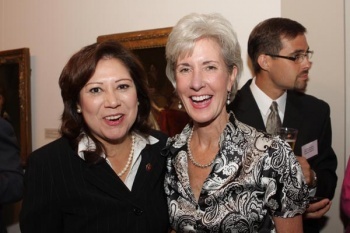 In 2003 Solis became the first Hispanic woman to serve on the powerful House Committee on Energy and Commerce, she served as Vice Chair of the Environment and Hazardous Materials (EHM) Subcommittee and a member of the Health and Telecommunications subcommittees. Solis also served on the House Committee on Natural Resources. On October 18 1997, Matthew Martinez, State senators Hilda Solis and Diane Watson, City Councilman Richard Alarcon, Miguel Contreras, executive secretary-treasurer of the Los Angeles Federation of Labor and Geraldine Washington, president of the Los Angeles NAACP addressed a Los Angeles "show us the living wage jobs" rally, as part of a national day of action, calling on Congress to pass the Martinez Jobs Bill. there were concurrent rallies in nearly 20 cities, organized by the Communist Party USA dominated National Labor-Community Coalition For Public Works Jobs. Pastor Cecil Murray of the First AME Church in South Los Angeles sponsored the rally. Hilda Solis also enjoyed strong union and Communist Party USA backing) when she ran for U.S. Congress in 2000. I have good news that members of Congress: Grace Napolitano, Lucille Roybal-Allard, Loretta Sanchez, Helda Solis, Xavier Becerra and our California State Senator Richard Polanco have joined us in opposition and support of our open letter/petition. A "No" vote to the war with Iraq. According to Harold Meyerson of LA Weekly, it was "L.A.’s liberal operatives who helped put Villaraigosa over the top". Antonio Villaraigosa’s 2005 Mayoral victory is the crowning achievement in the career of Parke Skelton, possibly the most principled political consultant in the business, who has steered to elected office virtually every liberal pol in greater L.A. — among them, Hilda Solis, Eric Garcetti, Jackie Goldberg, Sheila Kuehl, Karen Bass and Martin Ludlow. From April 11 - 14, 2001 Hilda Solis was in Cuba for unspecified purposes. The trip which was funded by the William C. Velasquez Institute, cost $1,214.50. "WAKE UP DEMOCRATS! Take Back the Country" Conference, with Rob Reiner, Robert Reich, Robert Rosendahl, Rep. Hilda Solis, Rep. Henry Waxman, Rep. Jesse Jackson, Jr., Rep. Dennis Kucinich, Ed Begley, Jr., Robert Borosage, Vincent Bugliosi, Warren Beatty, Susan Lerner, Rep. Maxine Waters, Roy Ulrich, Medea Benjamin, S. David Freeman, Peter Navarro, Hon. Jackie Goldberg, Harold Meyerson, Hon. Antonio Villaraigosa, Amy Wakeland, Bob Erlenbush, Hon. Eric Garcetti, Tom Hayden, Aqella Sherrills, Parke Skelton, & Lila Garrett. Sponsored by SCADA. L.A., CA, 6/24/01. Thousands of people from across Southern California joined the 4th Annual Cesar E. Chavez Walk in East Los Angeles on Saturday, April 6, 2002 --marking the ninth anniversary of the legendary farm worker and civil rights leader's death and the 40th anniversary of the United Farm Workers. Walkers who assembled Saturday at East Los Angeles College Stadium for the walk included Chavez's widow, Helen, other Chavez family members and UFW President Arturo Rodriguez. Also participating were Hollywood figures including Martin Sheen; Jackie Guerra, Pete Leal, Austin Marquez, Edward James Olmos; Esai Morales; Mike Farrell; Ed Begley, Jr.; Marisol Nichols; Richard Coca, Evelina Fernandez, Mike Gomez, Sal Lopez, Dyana Ortelli, Jose Luis Valuenzuela; and Michele Greene. Many elected officials also joined the walk, including U.S. Rep. Hilda Solis, state Sen. Richard Alarcon, Sen. Gloria Romero, Sen. Nell Soto, Speaker of the Assembly Herb Wesson, Assemblymembers Marco Firebaugh, Judy Chu and Paul Koretz, and Board of Equalization member John Chang. After a brief welcome by emcees Sid Garcia (ABC7) and Nancy Agosto (KMEX-TV), participants traveled a five-kilometer route through the neighborhood before returning for free music and entertainment. Sponsors supporting the 4th Annual Cesar Chavez Walk included ABC7, KMEX, La Opinion, Super Estrella and L.A. County Supervisor Gloria Molina. In 2008 Solis was endorsed by JStreet PAC. In 2003 Rep. Hilda L. Solis served on the Progressive Majority Advisory Committee. Hilda Solis was on the list of 129 speakers at the 2003 Take Back America conference, which was organized by the Institute for Policy Studies, and Democratic Socialists of America dominated Campaign for America's Future. She was back in 2007. Hilda Solis was on the list of speakers at the 2009 America's Future Now conference, which was organized by the Institute for Policy Studies, and Democratic Socialists of America dominated Campaign for America's Future. An "insurgent" Hilda Solis was a keynote speaker at the 2005 Democratic Socialists of America national conference "Twenty-First Century Socialism" in Los Angeles, with DSA leaders Peter Dreier and Harold Meyerson. Saturday evening delegates recognized the contributions of DSA vice chair and Washington Post]columnist Harold Meyerson, Occidental College sociologist and longtime DSAer Peter Dreier and insurgent California Congress member Hilda Solis (D) who in turn provided in-depth perspectives of the political scene. Other speakers included ACORN chief organizer Wade Rathke, Kent Wong of the UCLA Labor Center and Roxana Tynan of the Los Angeles Alliance for a New Economy. Antonio Villaraigosa....He was a union organizer. He was the head of the ACLU. He came out the barrio and grew up very poor. His father was an alcoholic, beat his mother—he overcame incredible obstacles. He dropped out of high school, and went back and then graduated from UCLA. He worked his way up through the labor movement and then was elected to the state legislature, becoming Speaker of the Assembly. Congresswoman Lynn Woolsey, the first Member of Congress to call on the President to bring our troops home, was be in Los Angeles on Saturday February 4th 2006, for a 'very exciting but critical fundraiser against the most well-known, well-financed challenger she's ever faced". woolsey was facing a primary challenge from a termed-out Assemblyman Joe Nation, a moderate Democrat who has been critical of her stand on the war and on bringing home our troops. He is raising money from people who have given money to Tom DeLay and Bush-Cheney and his legislative district covers 60+% of Congresswoman Woolsey's district. Congresswoman Woolsey is a "champion of equal rights, civil liberties, protecting the environment and fighting for single payer healthcare. Congresswoman Woolsey must be re-elected by the same victory margin she has had in the past to send a message to progressives everywhere that's it IS OK to be courageous, and to not back down on issues that matter." Ben Affleck; Ed Asner; Warren Beatty; Jodie Evans; James Cromwell; Matt Damon; Tom Hayden; Wendy Herzog; Mimi Kennedy; Norman Lear; Stephen Rohde; Susie Shannon; Stanley Sheinbaum & Betty Sheinbaum; Lorraine Sheinberg; Kathy Spillar; Gloria A. Totten; Peg Yorkin; Senator Barbara Boxer; Congressman Joe Baca; Congressman Xavier Becerra; Congresswoman Lois Capps; Congresswoman Jane Harman; Congresswoman Juanita Millender-McDonald; Congresswoman Grace Napolitano; Congresswoman; Lucille Roybal-Allard; Congresswoman Linda Sanchez; Congresswoman Loretta Sanchez; Congressman Adam Schiff; Congresswoman Hilda Solis; Congresswoman Maxine Waters; Congresswoman Diane Watson; Senator Sheila Kuehl and Assemblywoman Karen Bass. The fundraiser was at the Stanley & Betty Sheinbaum residence in Brentwood. Both Sheinbaums have been members of Democratic Socialists of America. Hilda Solis is on the list of Congressional Representatives who have participated in hearings/briefings since 1998, with the very radical Institute for Food and Development Policy/Food First, founded by Frances Moore Lappe (Democratic Socialists of America, Institute for Policy Studies) and Joseph Collins (Institute for Policy Studies), authors of the book "Food First". Democratic Socialists of America, the SI's main U.S. affiliate was represented by DSA National Director Frank Llewellyn plus Duane Campbell and Dolores Delgado Campbell of DSA's Anti Racism network and the Latino networks. California State Senator Gil Cedillo, was also in attendance. 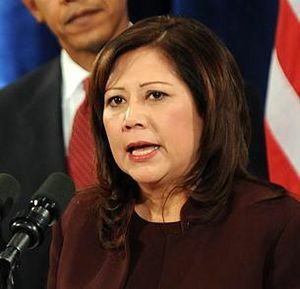 Hilda Solis was formally represented by Elena Henry, a caseworker from Solis's East Los Angeles Office. In 2007 Hilda Solis, endorsed Sen. Hillary Clinton for president and signed on to co-chair of the Clinton campaign’s Environmental and Energy Task Force and co-chair of the National Hispanic Leadership Council. Solis was joined by her friend and Democratic Socialists of America honorary chair, Dolores Huerta-Solis and Huerta had the honour of formally nominating Hillary Clinton for the Democratic primary. Together Huerta and Solis campaigned for Clinton through California and Nevada on a tour themed "Juntos Con Hillary, Una Vida Mejor" (Together with Hillary, A Better Life). Solis was elected to be Vice Chair of the Helsinki Commission’s General Committee on Democracy, Human Rights and Humanitarian Questions. She is the only U.S. elected official to serve on this committee. In August 2008 the Obama Campaign announced the formation of its National Latino Advisory Council, highlighting the continued growth of support Senator Obama is receiving in the Latino community nationwide. According to the campaign, the advisory council is made up of key labor, faith, community leaders, and elected officials from across the country and will serve as an advisory council for the campaign on issues important to the Latino community as well as play an active role reaching out and organizing Latinos in their communities and across the country. "As the Latino community continues to get to know Senator Obama, it is clear that he is the right candidate for our issues and is the best candidate to deliver the change that America desperately needs... Senator Obama not only understands the struggles and diversity of our community but because of his personal history and background he will stand with us and be a fighter for our issues. I look forward to continuing to work to elect Senator Obama as the next President of the United States." Hilda Solis claims inspiration from Cesar Chavez of the United Farm Workers and Dolores Huerta of UFW and Democratic Socialists of America. She has tried to get the U.S. Congress to honor both activists. Hilda Solis was a long time member of the Congressional Progressive Caucus. As at Dec. 18, 2008, Hilda Solis served on the Board of Directors for American Rights at Work. Following Obama's announcement that he had selected Solis as the nation's next Secretary of Labor, American Rights at Work Executive Director Mary Beth Maxwell stated: "Solis... will champion common sense policies like the Employee Free Choice Act to restore balance and create an economy that works for everyone". Chair of the Board, David Bonior, commented: "I’ve worked with [Solis] for years in Congress and she sits on our Board of Directors – she is a terrific leader who I know first hand will work tirelessly on behalf of America’s working families". Hida Solis' appointment as secretary of labor was welcomed by several key labor and socialist figures including Andy Stern, Anna Burger, Stuart Appelbaum and her colleagues at American Rights at Work, David Bonior, John Sweeney and Mary Beth Maxwell. One labor source said Solis’ name was put forward by Service Employees President Andrew Stern, whose union -- along with the Change To Win coalition -- endorsed Obama’s presidential candidacy long before the AFL-CIO did. SEIU is the biggest union in CTW. But leaders ranging from CTW Chair Anna Burger to AFL-CIO President John Sweeney to RWDSU President Stuart Appelbaum all welcomed the Solis appointment. Bonior, citing his work with Solis since she entered Congress in 2001 -- he was there until 2004 -- called her "a terrific leader who I know first-hand will work tirelessly on behalf of America’s working families." Sweeney said the AFL-CIO is “thrilled at the prospect of having Solis as our nation's next Labor Secretary...The AFL-CIO looks forward to working with Solis as she charts new territory for our nation's working men and women." In the House, Solis has continued to champion labor causes, immigrants' rights, women’s health and environmental protections. She also worked closely with Rahm Emanuel in recruiting Democratic House candidates from the Southwest and Latino-dominated districts, so she brings to her new job a strong relationship with Obama’s incoming chief-of-staff. Now, she’s in the key position to promote the Employee Free Choice Act, which seems likely to be the most contentious issue on Obama’s agenda. But Solis has never been deterred by controversy. In January 2009, Solis was nominated by the Obama administration for the position of Secretary in the Department of Labor and confirmed in February 2009. Her official title is "Chairperson of the Senate Health, Education, Labor and Pensions Committee". Sen. Ted Kennedy. was in charge of Solis’ confirmation. California labor leader and one time Democratic Socialists of America member Jack Henning died in June 2009. The son of a charter member of the plumbers union, Henning rose to become the longtime head of the California Labor Federation before his retirement in 1996. U.S. Labor Secretary Hilda Solis paid posthumous tribute to Henning's lifelong commitment to workers' struggles. "Jack Henning was a champion, visionary and unwavering voice on behalf of the working women and men of the United States and the world," Solis said. "We are all indebted to his leadership, and he will be missed." 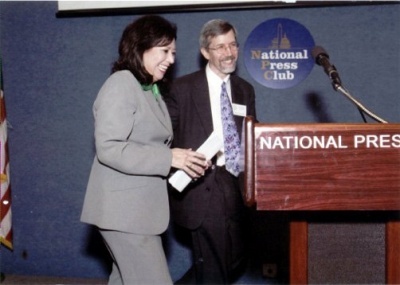 On October 15, 2009, Secretary of Labor Hilda Solis Presented Domestic Workers United with the Institute for Policy Studies Letelier-Moffitt Human Rights Award at the National Press Club in Washington, D.C. Domestic Workers United is a union for domestic workers, with the vision, "We have a dream that one day, all work will be valued equally". The IPS is a highly influential, but little known source of ideas, guidance and training for the U.S. and international left. It began as a revolutionary think-tank that consistently supported policies that facilitated the foreign policy goals of the Soviet Union and weakened the position of the United States. In Oakland, California, hundreds of workers, youth, and activists rose to their feet to welcome Secretary of Labor Hilda Solis who opened the Asian Pacific American Labor Alliance’s 3-day 11th biennial convention on July 22, 2011. Solis spoke of the employment crisis and the recovery of back wages for victims of wage theft, and was met with a standing ovation for her strong support for the DREAM Act. The convention’s lineup of speakers also included AFL-CIO Secretary-Treasurer Liz Shuler, AFSCME Secretary-Treasurer Lee Saunders, and SEIU President Mary Kay Henry. In accordance with the theme, "Generations United: Our Jobs, Our Rights, Our Future!" the convention successfully outreached to 200 young leaders. Fiery testimonials were given by student activists and DREAMers Ju Hong and David Cho, as well as Pulitzer-winning journalist Jose Antonio Vargas, who all shared their experience as undocumented immigrants and highlighted immigration as a key issue in the APA labor movement. APALA honored labor and community leaders during the sold-out gala dinner, and the grand ballroom was at-capacity with over twenty APA elected officials including Congressman Mike Honda, Mayor Jean Quan and State Controller John Chiang joining convention goers for a reception and dinner Saturday evening. The United Farm Workers' 50th Anniversary convention was held Saturday, May 19,2012. Rabobank Convention Center. Keene, California. In 2014 the PODER PAC President's Council consisted of Mari Del Carmen Aponte, Juana Bordas, Ingrid Duran, Grace Garcia, Comm. Sylvia Garcia, Susan Gonzales, Choco Gonzalez Meza, Laura Hernandez, Cynthia Jasso Rotunno, Lydia Madrigal, Joelle Martinez, Regina Montoya, Rep. Grace Napolitano, Maria Teresa Petersen, Laura Pena, Catherine Pino, Julissa Reynoso, Rep. Lucille Roybal-Allard, Rep. Linda Sanchez, Rep. Loretta Sanchez, Rep. Hilda Solis, State Sen. Leticia Van de Putte, Rep. Nydia Velazquez. Democratic members of the U.S. House Committee on Natural Resources hosted a public Forum on Environmental Justice in Los Angeles on April 8, 2015, as part of a series of roundtables convened by Ranking Member Raul Grijalva that included "stakeholders traditionally left out of climate and environmental policy discussions". Grijalva moderated the forum and heard from members of Congress, state and local officials, community and business leaders and environmental advocates. The goal of the Forum on Environmental Justice was to examine how to increase public participation through the National Environmental Policy Act; how to strengthen implementation of Title VI of the Civil Rights Act of 1964, which “prohibits discrimination on the basis of race, color, and national origin in programs and activities receiving federal financial assistance,” according to the Department of Justice; and how to increase the effectiveness of Executive Order 12898 (Federal Actions to Address Environmental Justice in Minority Populations and Low-Income Populations). The Forum also examined innovative efforts by the City of Los Angeles and the State of California to ensure that each community enjoys strong environmental protections. Solis received $1000 in lobbying funds from Planned Parenthood in 2008. Solis has been supported by EMILY's List during her campaigning. This page was last modified on 27 August 2017, at 18:44.